On Sunday, June 25, more than 10,000 runners participated in the B.A.A. 10K, presented by Brigham and Women’s Hospital (BWH). The fundraising team from BWH fielded 600 members, who ran in support of clinical care and research initiatives at BWH. Team members had different reasons for undertaking this iconic road race, but all ran with the same purpose: to support the hospital’s doctors, nurses, and staff as they work to improve the lives of countless patients and families. This year’s team raised $325,000. Check out the B.A.A. 10K Summary Report for a detailed look at how the funds raised are helping our doctors, nurses, and staff as they work to improve the lives of countless patients and families. To learn more about running the B.A.A. 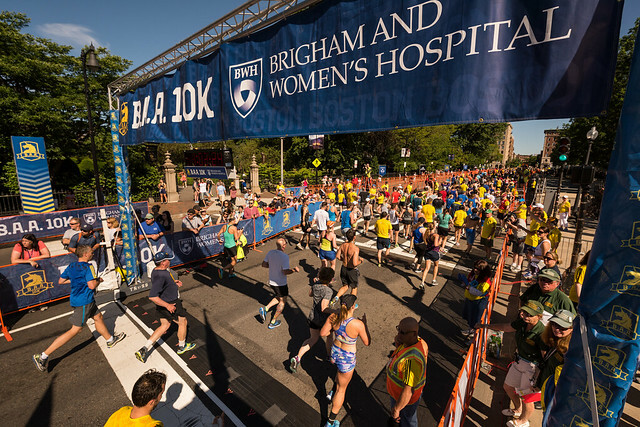 10K with Brigham and Women’s Hospital, please contact Caroline Duncan, assistant director of the running program, at bwhteam@partners.org or 617-424-4263.